The United States has always been regarded as one of Mongolia’s important partners and a “third neighbor”. What is your assessment of the overall development of Mongolia and the US relations under Mongolia’s “Third Neighbor” policy concept? Looking back in time, I can say that the Mongolia-United States relation has an almost centennial history of collaboration. Since the early encounters of American explorers, adventures and the landmark visit of Vice-President Henry Wallace to Mongolia in 1945, bilateral relations were carefully growing even in time of ideological division. After Mongolian democratic reforms in 1990, the United States actively supported the political transformation in Mongolia, which opened a new phase of effective and dynamic cooperation. The aspiration for laying the foundation of strong political relationship based on the principles of democracy and freedom were mutual and today these efforts have been elevated to the level of comprehensive partnership. Mongolia considers the United States as one of its key “third neighbors.” The policy concept “Third Neighbors” plays an important role in our foreign, national security policy and aims to diversify Mongolia’s external factors. It is extremely significant for us that this concept is welcomed and shared by our American counterparts. I would like to quote Vice-President Joe Biden. During his visit to Mongolia in 2011 he said that the United States was “very proud to be considered a ‘third neighbor’ … and the United States would continue to do their part to support Mongolia’s political and economic development.” Currently, our two countries work toward expansion of comprehensive partnership in different areas, including defense, trade and economy, culture, education and humanitarian sectors. Regular exchange of high level visits is crucial for deepening of bilateral engagements. The visits of Prime Minister of Mongolia to the United States in June 2015, followed by the visit of the Mongolian Foreign Minister in July, were successful in terms of maintaining high-level bilateral contacts. Another aspect of Mongolia and United States relations is the mechanism of bilateral dialogue. We have set up an Annual Bilateral Consultations between the Ministry of Foreign Affairs of Mongolia and the US State Department, which convenes on a regular basis. Similar bilateral structures of cooperation also exist in the field of defense, trade and investment. As I have mentioned, both countries share same values and principles of democracy as well as understand the importance of promotion of democracy globally. That’s another area of our cooperation. Mongolia is a comparatively young democracy, but it has its own unique character. During the last quarter of a century of development, Mongolian democracy made huge strides and also learnt quite many a lessons. We consider that sharing this experience with others would be our contribution to the promotion of democracy. Setting up international cooperation fund, organizing seminars and conferences on regional challenges and issues related to organizing free democratic elections, protecting human rights are some of the initial steps which have been already taken in this regard. Currently, we are working very close with our American as well as European and Asian partners in this regard. What are the highlights in Mongolia-US relations in 2015? And what are your expectations for 2016? 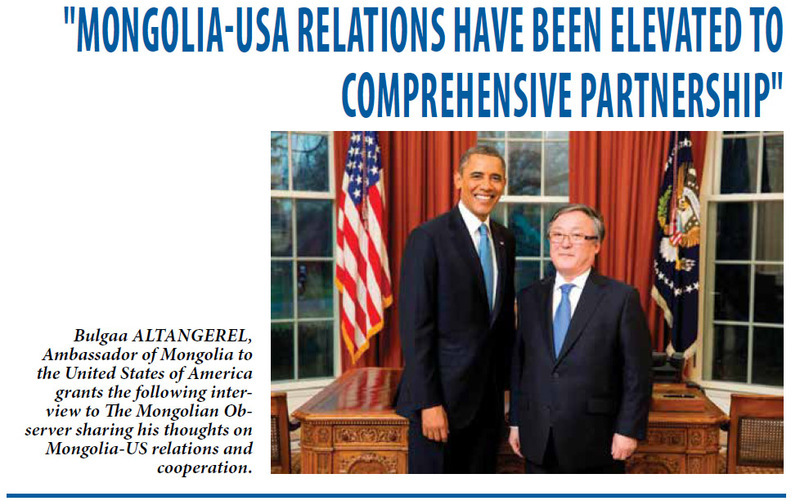 2015 was an exciting year for Mongolia- US relations, as Mongolia celebrated its 25th anniversary of democracy. I am pleased to note that high-level officials from the Department of State participated in the commemoration ceremony of Mongolia’s democracy in 2015 and conveyed the personal message of Secretary Kerry. Also the US Senate once again recognized and confirmed the support of Mongolian Democracy in its December resolution. Last year, we launched the first Mongolia-US-Japan Trilateral Dialogue in September in New York. The first meeting pioneered a consultation mechanism in a trilateral format, which aims to promote exchange of views on a broad range of issues of mutual interest. At the first meeting, the three sides discussed some topics of deepening regional security cooperation and expanding economic relations. On economic assistance cooperation, Mongolia was selected for the Second Compact by the Millennium Challenge Corporation (MCC), following the success of the 1st MCC projects. Subsequently, the two sides held the first Economic Policy Dialogue in Ulaanbaatar in 2015. Speaking of 2016, it is going to be another year of fruitful cooperation. This year coincides with the 25th anniversary of the arrival of the first Peace Corps volunteers in Mongolia. Peace Corps volunteers greatly contributed to the Mongolian society by teaching English, working in such areas as healthcare and youth education. Their efforts have enhanced and deepened without doubt people-to-people interaction, cultural and educational ties between our two countries. In 2016, we are expecting several high-level visits from both sides. One of them is the recent visit of a Congressional delegation from the House Democracy Partnership caucus headed by Congressman Peter Roskam in May. Talking about next year, Mongolia and the United States will commemorate the 30th anniversary of the establishment of diplomatic relations. 30 years is a relatively short period in international relations but I can confidently say that both countries have achieved concrete and solid results during these last 30 years. To show and explain these achievements to general public is a key objective of the celebration. I think a series of events will be organized in Mongolia and the USA simultaneously in 2017. Mongolia and the United States have established effective and dynamic defense cooperation. Could you please elaborate on the current status and the importance of these relations? Mongolia belongs to the Asia-Pacific region, where the United States plays an active role in maintaining regional security and peace. From the very beginning of the establishment of diplomatic relations, Mongolia strove to develop efficient defense cooperation with the United States. Today, this cooperation is having a positive impact on Mongolia’s defense reforms that allowed us to sustain and modernize the Mongolian Armed Forces (MAF) in order to safeguard national defense as well as to support Mongolia’s active part in international peacekeeping operations. With US assistance, Mongolia has beefed up its Armed Forces’ capability and has become one of the major contributors to the UN Peacekeeping Operations. Mongolia has deployed strong battalion with 850 peace-keepers in support of UN mission in South Sudan. We also provide vital medical assets (field hospitals) to UN mission in Darfur. Apart from this, numerous individual military officers from Mongolia currently serve at other UN peacekeeping missions worldwide. Mongolia-US defense relations are not only assistance-based cooperation. Mongolia deployed its Armed Force contingents in support of the US lead international coalition’s effort in Iraq from 2003 to 2010. Mongolia has been maintaining a limited military presence in Afghanistan since 2005, where our servicemen support US and NATO operations in fighting against international terrorism and in training the Afghan National Armed Forces. I would like also to mention the effectiveness of the Annual Bilateral Consultative Council meetings between the Ministry of Defense of Mongolia and the US Department of Defense. These meetings are very useful for determining the perspectives and scope of bilateral engagements. Effective defense cooperation between Mongolia and the United States certainly has a positive role in strengthening peace and stability in the Asia-Pacific region. Overall, I am very optimistic about the future of our defense relations. We believe that trade and economic cooperation should be one of the pillars of Mongolia-United States relations. Can you please share, Mr. Ambassador, your thoughts on the dynamics of bilateral economic relations? In today’s global environment, economic cooperation has become a driving force of a country’s foreign policy. This trend affects Mongolia also and our Government has defined economic diplomacy as one of the top priories of its foreign policy. Trade and economic cooperation with the United States has been expanding ever since we established diplomatic relations. At the same time, we have established a quite solid legal environment for strong economic ties. In 2004, we signed the Trade and Investment Framework Agreement (TIFA). This Agreement set up an inter-governmental dialogue mechanism for economic, trade and investment promotion between Mongolia and the United States. The most recent TIFA meeting was held in May 2015 in Ulaanbaatar. Last year, we also launched Mongolia-US Economic Policy Dialogue, which facilitated exchange of views on a broad range of economic issues of mutual concern. Additionally, Agreement on Transparency in Matters Related to International Trade and Investment (Transparency Agreement), signed in 2013 is essential for establishing more transparent and predictable legal framework for investment environment. Today, the United States is Mongolia’s fourth largest trading partner following China, Russia and South Korea. In 2000-2010, the volume of average annual bilateral trade with United States was around US$170 million. Thanks in large part to the mining boom, trade volume in 2011-2013 tripled and reached half a billion US dollar mark. During this period, import of machinery, vehicles and equipment from the United States prevailed in the overall trade turnover. However, in contrast, export from Mongolia to US accounted for less than one percent of the total trade volume. Recent global economic recession and slowdown in the mining sector have affected the flow of foreign direct investment and bilateral trade volume, which plummeted to $135 million in 2015. This is a noticeable drop compared with the previous years. In terms of foreign investment, the United States remains at the ninth place with around $300 million. Nonetheless, we consider this decline as a temporary and partial phenomenon and both countries have large potentials for greater future collaboration. As a country with estimated $1.3 trillion natural resources, Mongolia can be a great opportunity for US companies. US investment into Mongolia can steadily increase with the improvement of Mongolia’s investment regime and building up investor’s confidence and credibility. In my opinion, an effective combination of US companies’ leading technology, expertise, capital and Mongolian mineral resources and labor force can create a prosperous and mutually beneficial synergy for our two nations. Earlier you mentioned that Mongolia has been selected by the United States Millennium Challenge Corporation (MCC) for the second Millennium Challenge Compact. Can you please elaborate on the preparatory work for the second compact? Mongolia’s first Millennium Challenge Compact continued for five years and ended in September, 2013. This development assistance of $285 million under the First Compact was mainly directed to health, education, energy and road construction projects. One of the success stories is the construction of the Choir-Sainshand road (176.4 km), which significantly reduced the travel time between two cities from 5 to 2 hours. Based on the success of the First Compact and Mongolia’s strong policy performance, the MCC’s Board of Directors made a decision to select Mongolia for the second compact in December 2014. Today, our government has established a special working group and a national core team, which is working closely with the MCC’s Compact development team to identify the most assistance-needed sectors and develop projects. It is expected that a final decision on approval of projects and funding under the second compact will be made by the end of this year. What is your perception of the President Obama administration’s re-balance to Asia? I think this is an inevitable process connected to the global economic dynamics. Many researchers and analysts predict that the rapid economic growth of Asia will continue in the 21st century. Mongolia is an Asian country. Therefore, we should also actively participate in this process. The US re-balance to Asia opens up new opportunities for regional economic integration and free trade. The recent signing of the Trans Pacific Partnership Agreement by the United States and other regional nations is certainly a significant step towards creating a new market access for goods and services, by promoting jobs and growth across Asia and the Pacific. We are closely observing this process, which generally meets Mongolia’s aspirations for an active regional integration and APEC’s membership. Washington D.C. is home to many important financial and economic institutions such as the World Bank and the International Monetary Fund (IMF). What is the relationship of Mongolia with these organizations? This is indeed another aspect of my job in Washington D.C. Mongolia became a member of the World Bank group and IMF in 1991 after opting for free market economy. During the last 25 years, Mongolia has received technical assistance and soft loans totaling $816 million from the World Bank, which were primarily invested in various programs and projects aimed at carrying out economic and legal reforms, introducing modern technology and expertise, and providing monetary and nonmonetary incentives. Relations with IMF is characterized with the implementation of 5 programs including Stand-by (in 1991-1992 and 2009-2010), Poverty alleviation program (in 2001-2005), Program based loans (in 1993-1996 and 1997-2001) etc. Active cooperation with the World Bank and IMF is vitally important for Mongolia’s financial and economic sustainability. From our side, we attach special importance to the country reports and expert advice issued by these organizations. Mr. Ambassador, can you please tell us about the Mongolian community living in the United States? We have an unofficial number of almost 25,000 Mongolian citizens living in the USA, which makes it the second largest overseas Mongolian community after South Korea. Majority of Mongolians lives in large cities like Washington D.C., New York, Chicago, San-Francisco, and Denver. Mongolians started traveling to the US for educational, business and tourist purposes since the early 1990s. Today, Mongolians living in the USA are growing as a dynamic community. They have formed various professional associations and NGOs. These establishments are helpful in starting businesses or personal connections between Mongolians and to facilitate adaptation for newly arrived Mongolians. I am proud that today my fellow Mongolians work and study at world prestigious universities, research institutions and international organizations in the United States. Some of them are even employed on high-skilled positions by technological giants such as Apple, Google, and Facebook and by large banks and financial institutions. A number of Mongolians has established their small or medium enterprises here in the United States. Mongolian artistes living here are well known too. Our Embassy engages them in various cultural activities to promote our country. They are our cultural Ambassadors. The Embassy, as it has to do, makes every effort to be in contact with and provide information to the Mongolians living here and render all possible assistance for those in need. Speaking about culture and education, what are cultural and people to people ties between Mongolia and United States? Thanks to governmental and non-governmental scholarships by US organizations, many Mongolians have had the opportunity to study in the United States. The outcome of these scholarships is very efficient and, currently, the Government of Mongolia co-sponsors the Fulbright Program by annually sending about 15 students for studies here. On the other hand, many American scholars, researchers and students come to Mongolia to do their academic research and also to teach at Mongolian education institutions. There are many bilateral cultural exchange programs. Artists, singers, dancers from both countries participate in diverse cultural events organized in the two countries. Recently, the Office of the Mayor of Ulaanbaatar and Philadelphia Orchestra signed a Memorandum of Understanding, under which the famous Philadelphia Orchestra will perform in Mongolia in June 2017. Another direction of development of cultural and people-to-people ties is the expansion and support of Mongolian Studies in the USA. Historically, academic tradition of Mongolian studies in the USA was founded in the 1960’s with the establishment of Mongolian Studies program at the Indiana University. This pioneer program has played a huge role in developing Mongolian Studies in North America. Last year, with support from both our governments, the University of California (Berkley) launched Mongolian language learning courses within their Mongolian Studies Program. I must mention that non-governmental organizations such as Mongolia Society, Mongolian Cultural Center, American Center for Mongolian Studies, and Mongolia-American Cultural Association etc. are making a significant contribution to promoting Mongolian Studies in America. Our Embassy in collaboration with Mongolian Cultural Center annually hosts Mongolian Studies Conference in Washington D.C., which brings together Mongolists and researchers not only from the USA but also from many other countries. This year, the conference will be organized prior to the 11th International Congress of Mongolists, which will be held in Ulaanbaatar in August 2016. Lastly, what are possibilities of developing tourism between two countries? Mongolia has always been one of the exotic destinations for American tourists and travelers. Blue sky, nomadic lifestyle, beautiful nature of Mongolia attracts visitors from all over the world and has become a brand name of Mongolia. I can say that tourism sector is growing year by year and many Americans visits Mongolia for recreational as well as business purposes. On the other hand, the number of Mongolians visiting the USA is increasing. This is a very positive trend for the development of tourism as well as for improving the quality of service and competitiveness of companies in the tourist industry. Having lived in the USA for some time now, I have personally noticed big interest of general public especially young Americans in dinosaurs and fossils. So I think fossils can be a new brand name for tourism in Mongolia. By the way, the American explorer Roy Chapman Andrews made his famous discoveries on dinosaurs eggs based on fossils found in Mongolia in the early 20th century. Talking about fossils, I would like to say that the Mongolian side is extremely thankful to the US law enforcement agencies for their commitment and support in returning dinosaur fossils illegally smuggled out of Mongolia. In April, 2016, the office of the US attorney for Brooklyn, New-York organized a ceremony of repatriation of fossils to Mongolia, which is the second event of this type during the last three years. Repatriation of fossils to Mongolia is another example of successful cooperation between Mongolia and the USA.